Do you have a pile of cardboard boxes in your house, just lying around, eating dust, waiting to make the inevitable journey to the dump yard? Did you keep them safe all this while thinking you could teach your child about recycling? Are you looking for fun ideas through which your child can convert these waste materials into something useful? Well, we’ve got that sorted. Better yet, we could help you spend some quality time with your child, help develop his/her creativity and teach them about recycling. We are talking about some good old-fashioned waste material craft that you simply will enjoy with your child. And the best part is, we’ve segregated these waste material crafts according to age groups so you can find the ones that will best suit your child! In fact, if you have a school project coming up, we have a couple of waste material project ideas for school too! So what are we waiting for? Let’s get started! 36 waste material craft activities to teach kids about recycling! Oh no! I’m not a Parent! Let’s have a little art-attack now—painting by reusing bottle caps and chart paper. Let your little one dip the bottle caps in different colours and paint a meadow filled with colourful wildflowers. Check out our waste material craft idea. Help your child create a parking to store his/her automobiles. A awe-inspiring waste material craft idea that about recycling a cardboard box, colouring it, and transforming it into a parking lot of his/her own. How about engaging your child with this artsy activity where he/she recycles and reuses a cardboard? 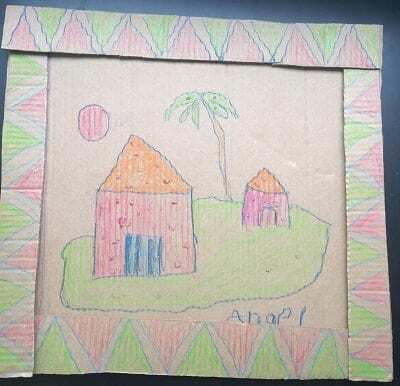 So, before you pick out the colours, check out this simple waste material—cardboard—craft idea on Indian Moms Connect. Ready? Time to build a mighty little toy fighter plane with this delightful waste material craft idea. Your child is sure to love building his/her own toy fighter plane. Your child’s grasping skills and hand-eye coordination will definitely get a boost. So, let’s begin. Does your child get all curious and excited when he/she spots a plane flying in the sky? Does he/she imagine flying like one? Then, let’s make an interesting hanging decor that can be hung in your child’s room. With this waste material craft aeroplane activity, you can create a colourful airplane. Ready? If you spent your childhood summer vacations surrounded by coconut trees, then we’re sure you must have tried this before. When children experiment with materials, they learn through play! And not to forget, leaf art and craft can be totally engaging! The coconut leaf whistle is one of them! It’s time to launch your child into outer space and reach for the stars because we have a trans-galactic waste material craft rocket activity for your little astronaut! Use toilet rolls and convert them into space rockets—and enact an Apollo Mission role-play while you’re at it! Save the shavings next time you sharpen your child’s pencils, because we have an amazing pencil art activity to trigger your child’s creativity! How about we tell you how to use pencil shavings imaginatively and craft designs! It’s 8 am—time to get ready for school! Is your child’s hair all neat and combed? Speaking of combs, how about using the comb as a tool of art to come up with textured patterns? Let’s make a waste material craft windmill activity of a wind-generating windmill with a comb and fill it with colourful streaks! Here’s a fun structure for your little builders and innovators to engage with. Use clay and straw to teach your little one about 3D shapes. As he/she gets curious and asks questions, you can also teach your kid about different dimensions in simple ways with straw structure activity! Pick up the fallen leaves and convert them into animals! Here’s a fun activity to engage your kids while they’re at home. Try this leaf art animal shapes activity with your little ones! Inculcating the habit of reuse and recycle helps your child go green from an early age. How about getting him/her to learn about it the fun way? Oh, you can also teach your little one about the value of money! Make a bottle piggy bank by reusing a water bottle, chart paper, and eraser. While doing this activity, your child’s fine motor and creative skills are engaged, besides gaining confidence as he/she begins to use the piggy bank. Looking for fun activities to engage your child while at home? How about making a waste material craft stone paperweight with abstract art? Some stones and paint are all you and your child will need. Have you introduced your child to the game of tic tac toe? Well, it’s time to introduce him/her to this simple logical game. How about a little twist to make the game more engaging? Here’s a creative and fun waste material craft pebble game activity for your kindergarten child to engage with. Is eating vegetables a touchy topic for your child? Then how about making it fun for your child with this colourful, easy, and messy activity turn vegetables into bookmarks! In this DIY activity, the child engages his/her sensory skill—feels different textures, mixes different colours. He/she also gets creative and communicates his/her ideas. You could introduce different types of vegetables too! So let’s get started with food abstract art! Can toy stars dance? Well, here’s one way to find out. How about doing an interesting activity with magnets to explain the science concept of magnetic repulsion? Doing this fun magnetism star activity, your kindergarten child learns about the magnets and engages his/her communication and fine motor skills. Hey be careful while playing with clothespins! Alligators are out to snap your finger off! You don’t think so? Well, then this waste material craft activity is just the thing! Your child will have so much fun making a friendly little alligator. How about creating a miniature postbox table décor with this waste material craft activity? All you need is an used plastic jar, black and red paints; the craft postbox will be ready in no time. You can leave tiny positive letters for your child to open every day! An itsy-bitsy spider is going to climb out of the paper cup! Let’s make sure it’s not the scary kind, shall we? Recycle paper cup and transform it into a spider of any colour with this thrilling waste material craft idea! We made a black tarantula with red legs. Here’s how you can recycle a cardboard box and make a storage station for your child to store anything. For this simple waste material crafts activity, you are gonna need a big or small cardboard box, some coloured sheets, glue, tape. So all set? A little nostalgic décor with an used matchbox. Remember the good old cassette player? Well, what better way to tell your child stories of your childhood. With this enchanting waste material activity, walk down the memory lane. Ah sigh! Has your child seen a letterbox? Whether a yes or a no, he/she is sure love this waste material craft idea. Recycle and transform a matchbox into a letterbox! Once done, leave it on your little one’s table with tiny reminder notes and all. 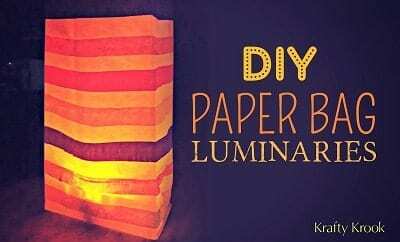 Recycle the paper bags lying around and make turn them into colourful luminaries with this wonderful waste material craft activity on Krafty Krook. Your child will love all the snipping and gluing with colourful crepe papers (the ones you use for birthdays!). Here’s how you can do. What if you can make some tote bags by reusing your old t-shirts? Here’s a thrilling waste material DIY activity, which we made for World Environment Day, for your child and you to try out. Apart from recycling, you get to create your own bags for grocery, everyday use, etc. Go green then? Vroom! Your child and you are about to transform used matchboxes and bottle caps into a jeep with this waste material craft idea! Get paint colours and paintbrushes at the ready! Let your child choose the colour of his/her choice! A clothespin is ideal to create a shark. Shhh! This waste material craft activity has to be done with absolute care. It’s shark teeth, after all. Help your child make a shark about to gobble a fish. It can be a prop for pretend-play and stories. With a couple of used matchboxes and some paint, build a mini bunker bed table décor. Here’s the waste material craft idea that is sure to make your child jump with joy. Imagine using it as a prop while telling bedtime stories! Pack your suitcase and head for a holiday! Oh wait, you can needn’t have to just yet. How about creating a mini suitcase with this waste material craft activity. Your little one will have ball of a time snipping and painting! Have seen a robot made of matchboxes? Here’s one for you to try. With this waste material craft activity, build a robot out of used matchboxes. Let your little one help you in creating one. Once done, tell a story like a robot! This new school term helps your child organise and stack the stationery items. How about a fruity twist to this study table décor? We made a pineapple pen stand, a waste material craft activity that your little one would love. You will need a used plastic jar. Ready to create lighthouse out of recycled bottle? With this waste material craft idea, your child and you can paint an awe-inspiring set-up of the nautical lighthouse. So pick out all the necessary craft supplies and get ready to anchor a lighthouse by the shore! Reuse paper cups into wind turbine with this creative waste material craft idea. As your child paints, glues, and creates the windmill, you can discuss about the clean energy, the wind energy. Recycle some paper cups along with your little one! Why doesn’t water and oil mix? When your child asks you questions such as this, you say it’s because of density. Well, how about explaining this concept in a colourful way? By doing this science experiment fireworks in a jar activity, your child will learn about a new concept, he/she will be curious to learn about why there is the colours burst out and goes about to discover the concept of density in a colourful manner. It’s fun to create new things from scratch. But there’s a completely different thrill added when you re-use old things to create something fresh! Wouldn’t it be amazing (for us and for our planet) if our kids could also learn the art of recycling waste material! Well, in today’s activity, we’re reusing a bottle cap to create a cute li’l key chain. Are you ready? Let’s get started with bottle cap key chain! If you are wondering how a rocket can make for a photo frame, well then check out this waste material craft activity. By recycling bottle and some chart, your child will be able to build a rocket photo frame décor. Did your child and you have fun creating some wonderful crafts out of waste materials? Well, these set activities are sure to help your child’s imagination, motor, and coordination. Do tell us which all activities your little one liked in the ‘Comments’ section. Originally published on 17th Aug 2016. Updated on Dec 20th 2017.